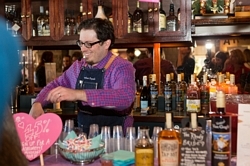 The Cocktail Guru offers a wide variety of drink-related services for special occasions. From bachelor/ette and bridal shower mixology classes, to signature cocktails, to bar catering and staffing, to themed "Spirit" tables, to Champagne Sabering demonstrations, and more - we are here to be your personal Mixologists. Complete the form below to send The Cocktail Guru an e-mail message.